Life decisions are that much easier when you are not limited by your finances. 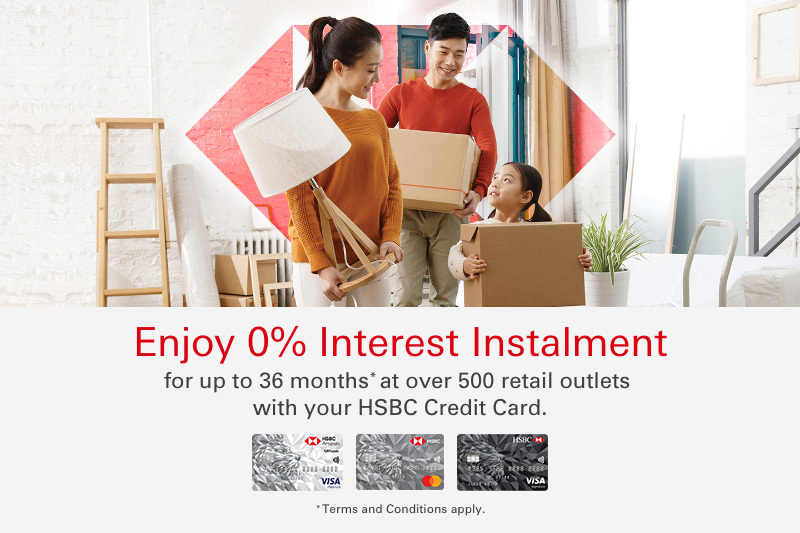 With the 0% HSBC Card Instalment Plan, you can now have the flexibility to get any of your desired items without a worry. Issued by HSBC Bank Malaysia Berhad (Company No. 127776-V). *Payment must be made with an HSBC Credit Card issued in Malaysia. Minimum purchase amount is dependent on the terminals used by the individual merchants and may be RM500.00 or RM1,000.00. The instalment tenure ranges from 6 months to a maximum of 36 months, depending on the participating individual merchants and subject to change from time to time. Full Terms & Conditions for HSBC Card Instalment Plan. To avoid financial charges being imposed, all cardholders who have subscribed to a 'zero-interest/interest-free' monthly repayment plan(s), are required to make payment of the monthly instalment specified by the bank at the time the Instalment Payment Plan is entered into ("the Monthly Instalment") in full. In the event a cardholder opts to only pay the minimum amount of five percent (5%) of the balance remaining unpaid under the Instalment Payment Plan, ("the Outstanding Balance") or Ringgit Malaysia Fifty (RM50), whichever is higher, instead of the Monthly Instalment in full, the cardholder will be liable for the interest charges on the Outstanding Balance.